Karachi often makes news for its recurring episodes of violence which claim many innocent lives. Yet, the city continues to be a big draw for large numbers of rural migrants looking for better economic opportunities. In spite of the many problems they face, it's a fact that even the slums in Karachi offer them better access to education and health care--basic ingredients for human development. Wired: What makes squatter cities so important? Stewart Brand: That's where vast numbers of humans—slum dwellers—are doing urban stuff in new and amazing ways. And hell's bells, there are a billion of them! People are trying desperately to get out of poverty, so there's a lot of creativity; they collaborate in ways that we've completely forgotten how to do in regular cities. And there's a transition: People come in from the countryside, enter the rickshaw economy, and work for almost nothing. But after a while, they move uptown, into the formal economy. The United Nations did extensive field research and flipped from seeing squatter cities as the world's great problem to realizing these slums are actually the world's great solution to poverty. Wired: Why are they good for the environment? Brand: Cities draw people away from subsistence farming, which is ecologically devastating, and they defuse the population bomb. In the villages, women spend their time doing agricultural stuff, for no pay, or having lots and lots of kids. When women move to town, it's better to have fewer kids, bear down, and get them some education, some economic opportunity. Women become important, powerful creatures in the slums. They're often the ones running the community-based organizations, and they're considered the most reliable recipients of microfinance loans. Wired: How can governments help nurture these positives? Brand: The suffering is great, and crime is rampant. We made the mistake of romanticizing villages, and we don't need to make that mistake again. But the main thing is not to bulldoze the slums. Treat the people as pioneers. Get them some grid electricity, water, sanitation, crime prevention. All that makes a huge difference. You may want to read a new book "Instant City -- Life and Death in Karachi" by Steve Inskeep. I'm already half way through Inskeep's Instant City. It's quite interesting. Riazbhai, that is good news and bad news. 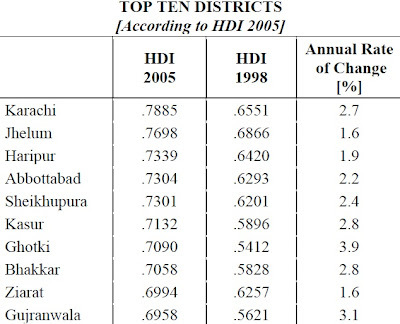 If Karachi and other districts have high HDI then other parts of the country are living in poor conditions because overall HDI is 0.504. Is this a new kind of feudalism?? Umar: "that is good news and bad news. " I see it as good news. It raises the hope that, in spite of the short term pain, the current wave of rapid urbanization will lead to higher levels of human development for Pakistan in the long run. There are many benefits of rural to urban migration for migrants' lives, including reduction in abject poverty, empowerment of women, increased access to healthcare and education and other services. 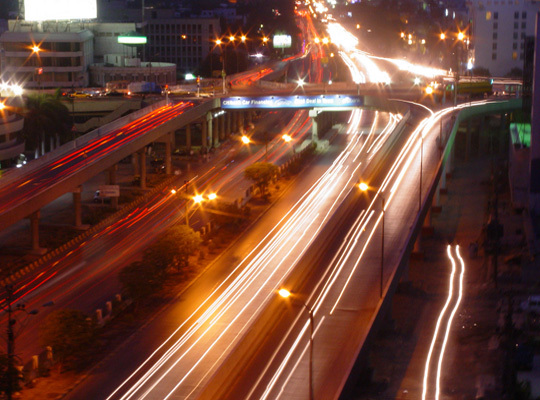 Historically, cities have been driving forces in economic and social development. As centers of industry and commerce, cities have long been centers of wealth and power. They also account for a disproportionate share of national income. The World Bank estimates that in the developing world, as much as 80 percent of future economic growth will occur in towns and cities. Nor are the benefits of urbanization solely economic. Urbanization is associated with higher incomes, improved health, higher literacy, and improved quality of life. Other benefits of urban life are less tangible but no less real: access to information, diversity, creativity, and innovation. LONDON, 14 November 2011 (IRIN) - Pakistan’s army of “Lady Health Workers” – some 90,000 strong – was never meant to diagnose and treat serious illnesses. Instead, these female community health workers (in Pakistan, men cannot visit families) were expected to teach good hygiene and nutrition, provide family planning advice, monitor pregnant women, weigh and vaccinate babies and treat minor ailments. Yet a new study shows that these same women could hold the key to treating pneumonia – the world’s leading killer of young children. The study, published by The Lancet medical journal and conducted by Save the Children US, funded by the US Agency for International Development and coordinated by the World Health Organization (WHO), found that children suffering from severe pneumonia were more likely to recover if treated at home by these women rather than in a health facility. The study followed 3,211 children, whose progress was checked six days after the start of treatment. Among those treated by their local health worker, only 9 percent failed to respond to treatment. In the control group, 18 percent failed to respond. The children visited at home started treatment sooner, and were sure to get the most suitable drug, while prescriptions in government and private clinics were far less consistent. The message was reinforced by the Elizabeth Mason, director of WHO’s Department for Newborn, Child and Adolescent Health. “Supervision is absolutely critical, and it is one area that programmes have to ensure that they have well in place,” she told IRIN. The programme also brought benefits to the women, elevating their status. In Haripur, when people saw that the women could treat seriously ill children and save their lives, their status rose dramatically, according to Sadruddin. By the end of the two-year trial, families were far more likely to make the Lady Health Worker their first port of call when their children were ill.
shared access to voice (PCOs) to LHWs in remote parts of the country. ability to access emergency health care. Ambulance Driver and 24/7 Private Hospital. (Option 2) in Muzaffargarh to 242 LHWs. thanks for keeping statistical hope alive. The numbers look OK on paper but how to make chaos of karachi stream line is going to be interesting. so much talent wow in city of candle light. Yet Population Year is drawing to a close and no census is in sight. There are many reasons: the precarious security situation, repeated flooding in many parts of the country, lack of resources to train the 225,000 census takers required to conduct the head count in time. But the main reason is politics. The major parties draw their power from rural constituencies, and by highlighting the extent of the country’s urbanization, a census would lead to the creation of new urban constituencies. With an eye toward the national elections slated for 2013, many Pakistani politicians are doing everything in their power to circumvent or delay a count. The country’s largest parties, the governing Pakistan Peoples Party and the opposition Pakistan Muslim League-N, are particularly threatened by the prospect of reduced rural constituencies. Newcomers such as the cricketer-turned-politician Imran Khan, the founder of Tehreek-e-Insaf, which enjoys significant support in Punjabi cities, stand to gain. Since the 1980s, ethnic Pashtuns and the Urdu-speaking Mohajirs, migrants from northern India, have clashed over access to property and jobs in Karachi. Criminal gangs with ties to political parties — including the ruling P.P.P. — had been warring over smuggling rackets and extortion rings. But as election year approaches, it is Karachi’s shifting demographics that are driving much of the violence. ISLAMABAD: More than half of Pakistan’s population is estimated to be living in cities by the year 2030. Both natural increase and net migration are major contributory factors to urban growth. These views were expressed by participants of a seminar on “Business and the Middle Class in Pakistan organized by the Planning Commission of Pakistan which was held here on Wednesday. The seminar included speakers and discussants from some of the largest companies and businesses in Pakistan, coming together to discuss the importance of the evolving middle class in Pakistan. The participants said that current urban growth rate was approximately 3.5 per cent as compare to 2 per cent nationally. More rural people are migrating to urban centers for higher-paying jobs. Upward social mobility creating and expanding the middle class. Given the low median age, Pakistan’s middle class is unusually young as compared to developed economies, meaning that younger population will have the most disposable incomes.The expanding middle class consumers will aim for first world aspirations and greater focus will be on branded retail products. The middle class has been growing in number as well as in importance all over the world, which is why businesses strategize targeting this specific class. The participants said that the middle class is conceptually defined as the class between the rich and the poor; however its boundaries are usually made arbitrarily. It is also important to note the multi-dimensionality of an adequate definition; a person belonging to the middle class needs to be evaluated not only on a monetary basis, other aspects of quality of life and available opportunities need to be encapsulated to arrive at a well rounded definition. They said that studies show a positive relationship between the higher share of income for the middle class and economic growth as well as political aspects like democracy. Other studies indicate the emergence of entrepreneurs from the middle class. It is the middle class that was the driver of success in India and China. They said that the biggest opportunity of the rising middle class, at present and future will be for companies selling mass-consumer goods and services. As incomes rise spending patterns will incorporate discretionary and small luxury items while proportionate expenditure on food, clothing and other necessities tend to shrink. While the basics may decline as a share of consumption, in absolute terms they will continue to grow. Housing, healthcare and educational expenses are expected to register a greater share of the wallet – this spending will be driven by the strong link between education and higher salaries, as well as growing number of options for both higher and vocational education. KARACHI, Dec 01 (APP): Speakers at UAE trade and investment conference at Karachi Expo Centre said Thursday that Pakistan was a growing market and UAE companies operating here would stay and make long term strategic investment. President and CEO of Pakistan Telecommunication Company Ltd (PTCL) Walid Irshaid said that his company will make more investment in Pakistan to fully transform PTCL into a world class telecome company. “We have transformed PTCL into a modern company offering all ICT products in Pakistan and we are here to stay”, he said while sharing the experience of his company in Pakistan and investment opportunities. He said that “Pakistan is a growing market and we are making long term investment to offer world class network to local consumers who are quality conscious”. Do not underestimate Pakistani consumers, he suggested. Regional general manager Asia Pacific North and Indian sub continent Etihad Airways, Joost den Hartog said that his airline was doing great business in Pakistan. “We are running daily flights from Karachi, Islamabd, Lahore to UAE and twice a week from Peshawar. We are planning to enhance our operations in Pakistan in future with the expansion of our fleet”, he noted. Hartog said that his airline is now catering for Pakistanis living in USA, Canada, Europe and Middle East and will soon start lifting Pakistani passengers for Frankfurt and Munich. Pakistani Ambassador in UAE Jamil Ahmed Khan advised Pakistani businessmen to take full advantage of opportunities in the Emirates for re-export business. He said that 40 percent of the exports to UAE are re-exported to African countries. He said that Pakistani exports to UAE can be enhanced from 2 percent of Emirates’ global trade to 6 percent with the help of planned efforts. Chief Executive Officer of Bank Al Falah, Atif Aslam Bajwa said that his bank is growing fast in Pakistan and “we have plans to further expand our operations in the country”. Chief Executive Officer, FlyDubai, Ghaith Al Ghaith said that the business of his airline has increased in Pakistan by 10 percent while it is growing worldwide at 12 percent. “We are planning to further expand our business here”. CEO Dubai Islamic Bank Junaid said his bank has plan to expand its branch network from 73 to 100 in Pakistan by next year and offer the entire range of Shariah compliant products in Pakistan. Director of IBA Dr Ishrat Husain said that foreign investors were never touched in Pakistan by any regime even during the nationalization in 1972. He said Pakistan has liberalized its foreign exchange regime and profits, royalties, fees can be fully repatriated. Acting President of FPCCI Khalid Tawab said that business chambers are playing their full to expand bilateral trade and investment between Pakistan and UAE. Meanwhile, consul generals and commercial officers of USA, China, Germany, Japan, Russia, Afghanistan and Korea also visited UAE Expo 2011 Magnificent 7 and took keen interest in the products at display. “The Bank has responded flexibly in the face of the tremendous challenges Pakistan has gone through over the past year or so,” said its Pakistan country director Rachid Benmessaoud. “We will continue our strong support to Pakistan, while keeping a keen eye on implementation to ensure that these efforts translate into real results on the ground,” he said. The bank’s progress report on its Pakistan program said its efforts had been disrupted over the past two years by the devastating floods of 2010-2011, ongoing security problems as well as “slow economic reform”. “Shifting the focus and resources in response to the floods led to a delay in infrastructure investments,” it said. It said Pakistan’s economic recovery from the floods and other problems remains slow, with growth of 3.9 percent expected next year. “A range of governance, corruption and business environment indicators suggest that these areas remain a challenge,” it added. The funds include $4 billion in development assistance and $1.5 billion from the bank’s International Finance Corporation, which helps private sector firms. ...Karachi contains 62 per cent of Sindh’s urban population; 30 per cent of Sindh’s total population; and 22 per cent of Pakistan’s urban population. Lahore, the second largest city in Pakistan, on the other hand, contains only 22 per cent of Punjab’s urban population; seven per cent of Punjab’s total population; and 12 per cent of Pakistan’s urban population. Individually, the other major cities are a very small fraction of Karachi and Lahore. Karachi’s large-scale industrial sector employees make up 71.6 per cent of the total industrial labour force in Sindh; 74.8 per cent of the total industrial output of the province is produced in Karachi; and 78 per cent of formal private sector jobs of the province are located in Karachi. Then there are powerful federal government interests as well, in the form of the Karachi Port Trust, Port Qasim, Customs, Railways, Civil Aviation Authority and the armed forces and their various industrial and real estate activities. The city contains 32 per cent of the total industrial establishment of the country; generates 15 per cent of the national GDP, 25 per cent of federal revenues and 62 per cent of income tax. Also, the most important health, education, recreation, entertainment and media-related institutions in the province, are located in the city and so are the provincial headquarters. Provincial and state governments always have conflicts with powerful autonomous cities since the non-city population of the province or state feels that the city and its assets do not belong to them. Even in a relatively homogeneous country like Thailand, Bangkok was seen by the anti-government Red Shirt Movement as responsible for deprivation and inequity in the country. The second issue is related to the changing demography of Sindh. There is a fear among the Sindhi-speaking population (in which I include Balochi, Seraiki and Brahvi speakers as well) that they are being converted into a minority in their province. Let us see how real this perception is. Economist A.B. Shahid said Karachi’s contribution to GDP amounted to around 16 billion rupees a day, and its daily tax revenues to two billion. “Karachi is Pakistan’s economic engine, whenever it shuts, it affects the whole economy. Its taxes and industrial and services sectors feed the exchequer and its port being the gateway gives life to the rest of the country,” he told AFP. Market analysts say disturbances in Karachi are affecting foreign investment as well. “Most multinationals are based in Karachi, and it has a negative impact when their bosses watch pitched battles on their TV screens in the streets of Karachi,” said Mohammad Sohail, the head of Topline Securities brokerage. He said foreign investment in Pakistan stood at $5.4 billion four years ago, which shrank to $1.6 billion last year and is expected to further reduce to a maximum of $1 billion in the financial year ending on June 30. Officials admit growing security concerns and targeted killings tarnish Karachi’s attraction for foreign investors and risk driving business away. The American raid that killed Osama bin Laden in the town of Abbottabad last May was another punishing blow to Pakistan’s depleted image, raising renewed questions about whether anyone in authority had colluded with Al-Qaeda. “Local industrialists, mainly textile businessmen, are shifting their investments to Bangladesh, Sri Lanka and Malaysia because of law and order and energy shortages,” said a government minister on condition of anonymity. The authorities say they are doing their best to tackle the rampant unrest, but admit they have limited means at their disposal. Sharfuddin Memon, spokesman for the home department of Sindh province, of which Karachi is capital, admitted there were not enough policemen in the city but said they punch above their weight in terms of foiling crime and attacks. The decades since independence in 1947 have seen Karachi transformed into a patchwork of Pakistan’s different ethnic groups — Mohajirs, Sindhis, Pashtuns, Punjabis and Baloch — as migrants from all over the country have come in search of a better life. Millions in the city rely on daily piece work to make a living, and every day lost to violence or shutdowns is a day without income. Fruit seller Mohammad Haleem, 34, said the unrest was making it hard to make ends meet. “I could not earn livelihood for my five kids for most of the last week as it was dangerous to go outside,” said Mohammad Haleem, 34, a fruit vendor. 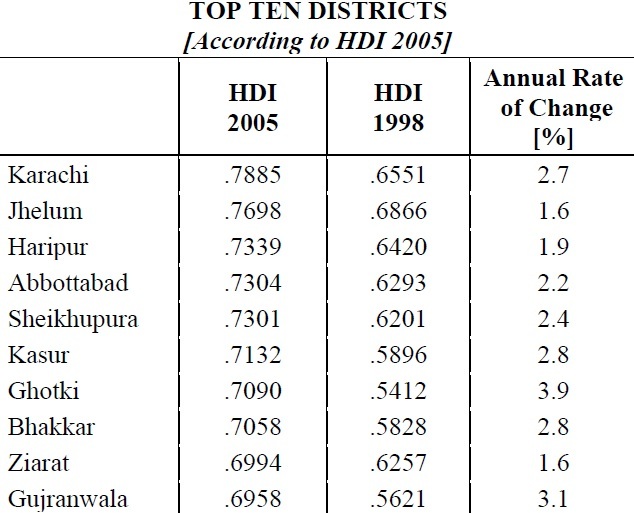 Lahore was the highest ranked city of Pakistan on the HDI with 0.877, followed by Islamabad and then Rawalpindi. 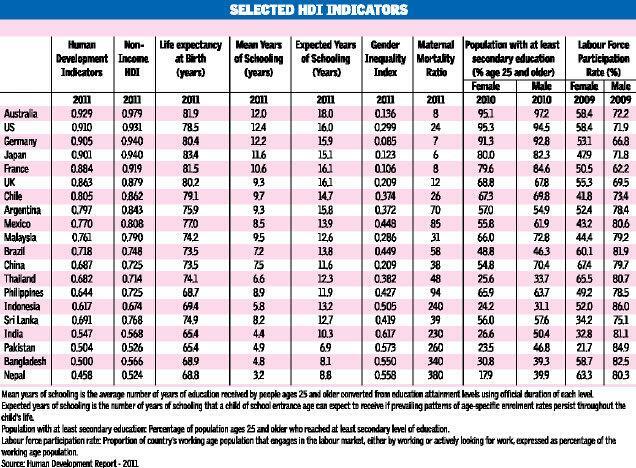 Four out of six cities of Punjab feature on the list of high human development including Rawalpindi (0.871), Sialkot (0.834) and Jhelum *0.829). Moreover, only one city from Sindh, Karachi, makes it to the high human development list with 0.854. 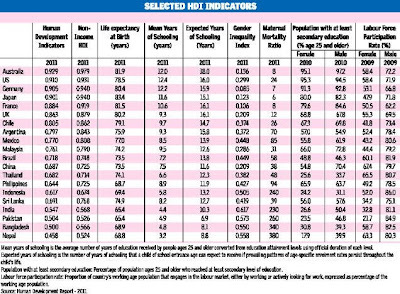 The high medium human development rankings include 18 cities from Punjab, four cities from Khyber Pakhtunkhwa and one city from Sindh (Hyderabad). Eleven cities each from Punjab and KP make it to the list of medium human development, which also includes four cities from Sindh and one from Balochistan (Quetta). Very low human development includes 14 cities from Balochistan, two from Khyber Pakhtunkhwa (Tor Ghar and Kohistan)and one from Sindh (Tharparkar). Pakistan itself ranks in the medium human development category of the global rankings. Meanwhile, Pakistan Tehreek-e-Insaf (PTI) Khyber Pakhtunkhwa chapter said the UNDP report exposed propaganda by the ruling Pakistan Muslim League-Nawaz (PML-N). The report is an analysis of first 18 months of the incumbent government, the PTI KP chapter said in a statement, which it said was even less than first two years of the government. "The stats of five years cannot encompass first two years," the statement said, adding that Khyber Pakhtunkhwa has surpassed rest of the provinces in performance and human development over the next three years. Over the next three years, 4 KP districts progressed in terms of human development, compared to 3 districts in Punjab, 2 in Balochistan and 1 in Sindh, it said. The PTI KP chapter said that under the tenure of Pakistan Peoples Party-led government in Sindh, 6 out of 10 Sindh districts fell prey to worst governance in the province. The PML-N, which came to power in Punjab six times, has been perplexed over the performance of PTI's first-ever government in KP, the statement added.